A few years ago we received Peter and the Wolf from Maestro Classics. We have always enjoyed listening to classical music but I was amazed at how much my children loved Peter and the Wolf. Even more wonderful was how much they learned by simply listening. Today, it is still a favorite in our home. Was it any surprise when we heard about the newest release, The Nutcracker, from Maestro Classics that we jumped at the chance to review it? There may have been even some stalking of the mailbox for The Nutcracker to arrive. When it finally arrived, there was no delay in listening and enjoying this beautiful presentation of a holiday classic. The Nutcracker composed by Tchaikovsky (a favorite composer here) has become a Christmas classic that tells the story of magical toys and dolls. In the middle of the night, the toys comes to life, Clara’s special gift, a nutcracker, becomes a prince, and they travel to the beautiful land of the Sugar Plum Fairy. In this one hour production, Jim Weiss, well known for his captivating storytelling, narrates this magical story and helps listeners of all ages enjoy all the action that plays out in this composition. The narration is weaved throughout the music and blends together beautifully. The Nutcracker is intended for ages 5 and up. However, be warned, those younger than 5 will likely enjoy listening and dancing along. We have enjoyed listening to The Nutcracker once, twice, and again and again. During lunch, rest time, or while doing school work, The Nutcracker provides for excellent “background” noise. Rainy afternoon and need a bit of exercise? The Nutcracker can be the answer! Heading out to do errands? Perfect time to pop in The Nutcracker cd. It is possible that my fifteen year old daughter and myself are enjoying The Nutcracker more than anyone. 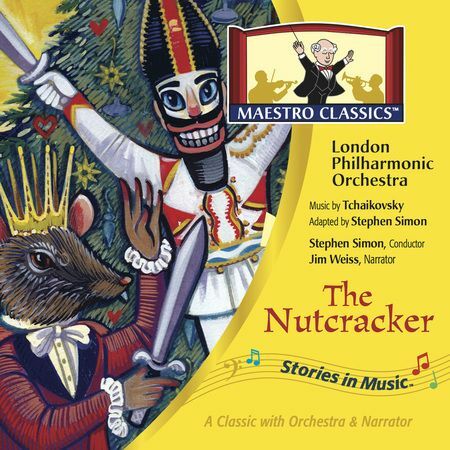 Tchaikovsky is a favorite composer of my daughter and I think the music of The Nutcracker is delightful. I actually have it playing right now and I can’t help but see the toy soldiers in my mind as I type. While we can simply enjoy the music and narration of The Nutcracker, Maestro Classics has provided a Free Curriculum Guide to enhance the musical experience. Whether used in a formal manner or just for added fun, the guide is a great way to take the music of The Nutcracker into all areas of learning. Math, Science, History/Geography and other subjects are included in the guide. The guide includes links to other sites that have printables, videos, and other resources. While there is a short biography of Tchaikovsky included in the CD Booklet, I think we are going to use resources from the Music section of the guide to learn more about Tchaikovsky. I debated doing it now but decided to wait. Why wait on the curriculum guide? We are simple enjoying The Nutcracker! And I wanted to wait until we were a bit closer to Christmas to implement a few of the resources. As we begin to prepare for the holiday season, this is the perfect time to include The Nutcracker from Maestro Classics. The music is stunning, the narration is perfect, and the story is ageless. This is an excellent way to encourage your children to not only appreciate but fall in love with the beauty of classical works. They are timeless. Thank you Stephen Simon and Maestro Classics for another excellent production. Want to get a taste of The Nutcracker? You can listen to a sample. The Nutcracker is available on a CD or MP3 format. Don’t forget about Peter and the Wolf and the other productions Maestro Classics has to offer! This entry was posted in Homeschool, Something to Share, The School Table, TOS Crew Reviews and tagged classical, curriculum, Homeschool, music by sweetie. Bookmark the permalink.